Darkholds: Ancient Barrows is a co-operative board game of combat and adventure in which you and your friends will play the part of heroes and henchmen that battle against the hordes of undeath to gain the ultimate prize - the secret of life after death! Two happy fellows enjoying a game of Darkholds! 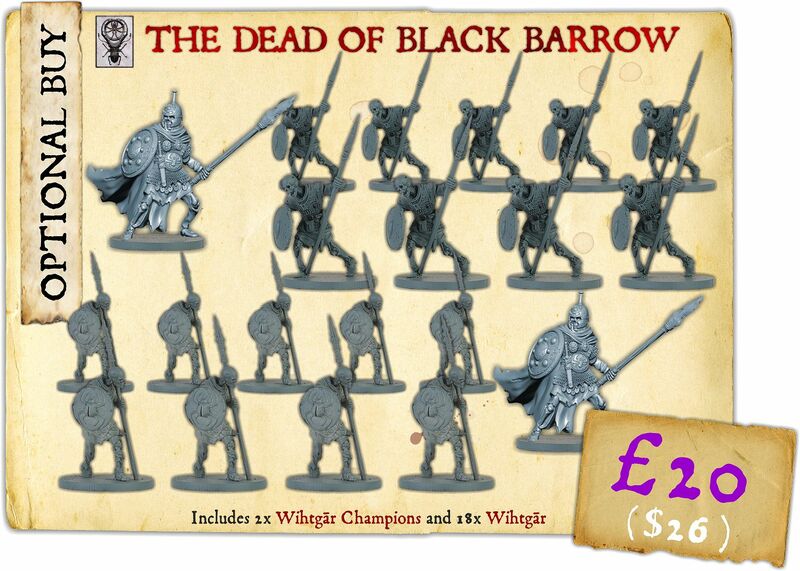 Set in the lands of darkness - the brutal, uncivilised world of dark ages Britain in the 7th century AD - Darkholds: Ancient Barrows is a board game containing miniatures, tiles, counters and cards to enable 1-4 players to control legendary heroes and their henchmen as they explore the caverns, barrows and halls of the undead Wihts. The game can be played as a story campaign comprising ten levels of varying design and aspect in three areas, beginning in the caverns and natural gorges near the coast (area 1, levels 1-3), then exploring the catacombs and barrows of the undead (area 2, levels 4-6) and eventually fighting through the halls of the ancients (area 3, levels 7-9) to gain the secret of undeath (the quest's end, level 10); but each level can of course be played on its own. You can even choose to play each area - three levels - as a mini-campaign! Players need not worry about the experience of their heroes or henchmen if they play later levels, either, for the skills and abilities of the adventurers are tied to the levels themselves. 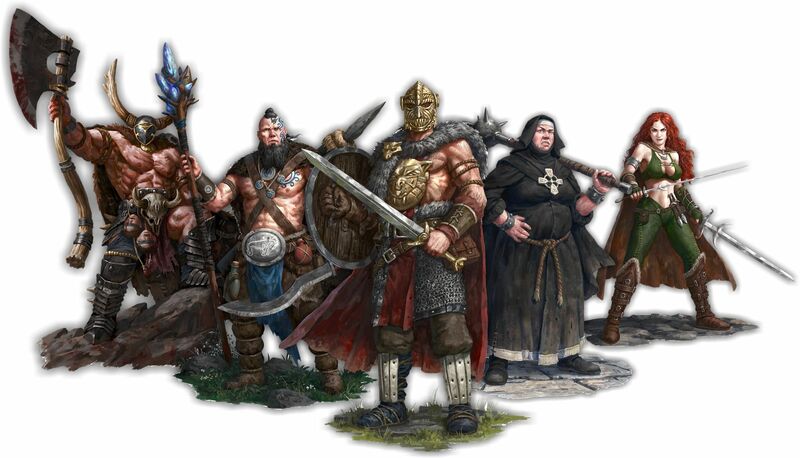 If Darkholds: Ancient Barrows is played as a campaign, players can purchase certain types of mundane equipment or hire henchmen in between levels - effectively meaning heroes have a retinue they can bring with them to the next level! To succeed in their quest for eternal life players must overcome a horde of enemies trying to stop their heroes, gathering treasure, ancient artefacts and sorcerous weapons or armour to help them along the way. 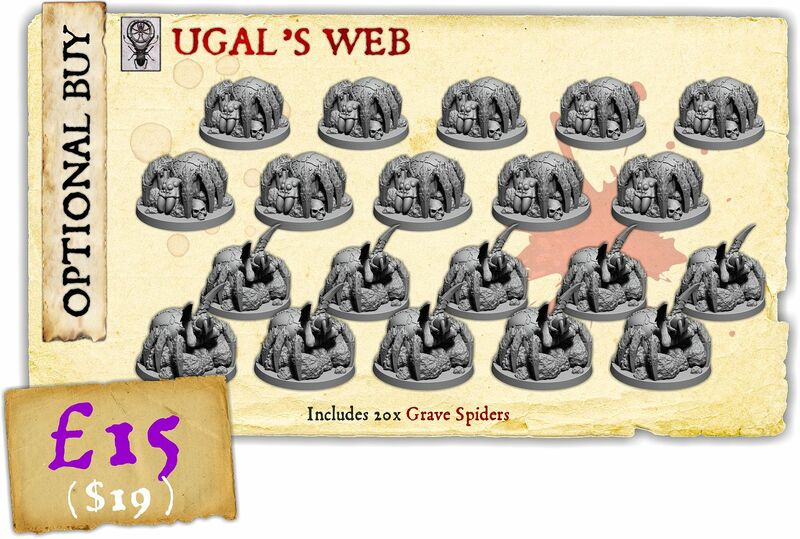 The Wihts, scampering grave spiders and huge, terrifying mound beetles, ancient Gāsta and shrieking Drēaguth all wish to deny the secrets of the Jutes to the outsiders, and they will do anything - including the destruction of their own halls and tombs - to stop them. Players must also understand that - whilst the game is co-operative - there will also be an element of selfishness to how each player plays the game, for each hero must draw a quest card at the beginning of each level. Darkholds players can choose to play any of the five heroes included in the game, all of whom are very different to each other. Depending on how many players there are, each player could control up to four heroes on their own! You could choose to play Penda the Bloody-Handed, a ferocious, skilful werwulf from Mierce; or Nerys, an abbess of the Brythoniaid who abhors the blasphemous undead and can heal the adventurers. Choose to play Penda the Bloody-Handed, or Nerys! Nerys, hero of the Brythoniaid. There's also Carrowek of Carn Dhu, a heavily muscled fighter of immense strength from Kernow; Sáthach, a highly skilled Irish rogue that kills her enemies with twin swords or throwing daggers; and Gnith, a powerful sorcerer from the mountains of Alba. Morag of Mann, project exclusive hero! 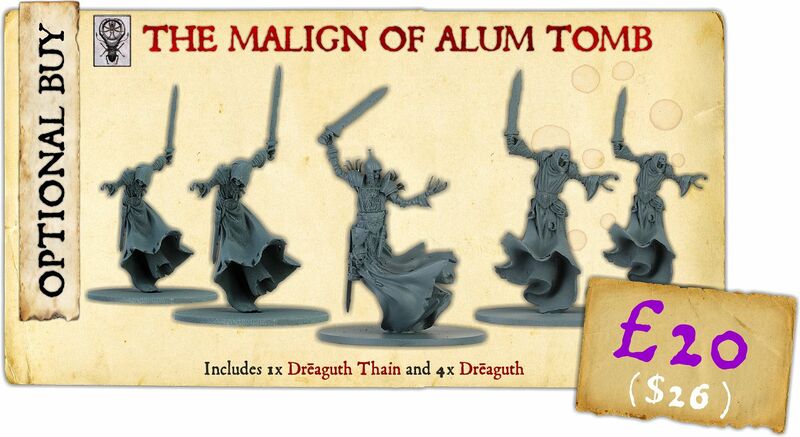 There will also be a hero exclusive to backers of the Kickstarter project - Morag of Mann, an adaptable sell-sword able to fight her way through the tombs with axe, harpoon or invocation! Backing the Darkholds project is the only way you will be able to purchase her. As well as the heroes, players will be able to hire - or possibly rescue! - henchmen from the lands of darkness. Carrowek will bring fellow fighters, Ax-Drunes, to fight for him. Penda will bring Gesithas, elite spearmen from his lands. Nerys brings black monks called Mynachod Du to protect and fight with her fellow heroes. Gnith will bring crossbowmen known as Elbharud to defend him from the attentions of his enemies, and Sáthach will be fighting alongside Fiannagh, warriors of Danu from Ireland. Morag may choose any henchman to adventure with her. As the project continues there will be hero and henchman expansion packs, so you can bring your favourite nobles from the lands of darkness - such as Daarkan of the Fomoraic, or Knútr of the Norse - to adventure with you! Throughout each level will be various bits of treasure, some artefacts or discarded weapons or armour that players can find and pick up, collectively known as equipment. Enemies, when killed, may even drop equipment! Each equipment marker found on a level enables a player to reveal an equipment card. This could be simple hacksilver or jewels - gold, in effect - to purchase equipment or hire henchmen with in between levels; an ancient artefact such as an amulet that heroes can use to increase their abilities, a torc to protect themselves or even an invocation to destroy their enemies with; a weapon such as a sorcerous axe that may be more powerful than their own, or can be used in addition to theirs such as a bow; or armour such as a helmet or a shield that could increase their protection and enable them to progress through a level without harm. Each equipment card also has a gold value, signifying its worth when sold, so even the most mundane item could prove useful when trading in between levels. Bear in mind there's a limit to how much a hero or a henchman can carry, however! Darkholds: Ancient Barrows has very simple rules that should prove no trouble to understand and use. We have provided a short video (with subtitles) below as an example of a full game turn. It shows various actions occurring, including those of the enemy. We kept it simple - no darkhold card was drawn - so that you can understand the basics. All warriors can see through friendly warriors, but cannot see through enemy warriors. Sight is drawn in straight lines through the centre or the corner of each square. Each game turn comprises a number of different phases which must be performed in the sequence outlined below. 1 - Hero Phase: each hero and henchman performs as many actions as his vigour attribute allows. 2 - Darkhold Phase: a darkhold card is drawn. 3 - Enemy Phase: each enemy warrior, starting with the closest to a hero or henchman and ending with the furthest away, performs as many actions as his vigour attribute allows. 4 - Reinforcement Phase: a reinforcement card is drawn for each entry point, from which more enemies emerge! 5 - Maintenance Phase: the level is tidied up; noise tokens are removed and other game mechanics reset, ready for the next turn. Once a turn is over, another turn begins until all of the heroes have made it to the level's exit. Each turn begins with the Hero Phase, in which all heroes and henchmen get the opportunity to progress through the level, fulfil their quests and reach the exit. Each warrior - friend or enemy - has a vigour attribute, which represent how many actions he can perform per turn. Each action performed uses a certain amount of vigour. For example, to Move a warrior from one square to another uses 1 vigour point, to Attack an enemy uses 1 vigour point, and so on. Heroes and the larger enemies generally have around 5 vigour points, and this can increase depending upon equipment found or other factors. Lesser enemies have fewer vigour points, of course - but there's so many of them, that's no handicap for them! The movement of your heroes and henchmen, and of course the enemies, is from square to square. Each movement from one square to another uses 1 vigour point. No warrior needs to turn to face, but it is often an aesthetic touch for a hero to look at his enemy! Warriors - unless they have a special ability - cannot Move through other warriors. Warriors can use combat weapons and ranged weapons to Attack enemies. Each weapon has Range, Attack Dice, Strike Value and Damage attributes, which can be seen on the Hero card below. The Range attribute notes how many squares away an enemy can be Attacked. A range of 1 means an adjacent square; a range of 1-5 means any square up to five squares away. The Attack Dice attribute notes how many D10s are rolled to try to strike the enemy. A 2 means two D10s, 3 means three D10s, and so on. The Strike Value attribute is the result on a D10 that must be achieved if a hero is to strike an enemy. For example, a 6+ means that a 6, 7, 8 or 9 must be rolled; a result below that is a miss. The Damage attribute notes how many wounds that weapon causes - if it strikes, and the enemy does not parry! Powerful enemies - and of course the heroes and henchmen - often wear armour that is used to parry a strike. Armour (and weapon and armour combinations) have a Parry Value attribute, which needs to be rolled on a D10 to parry that strike. For example, if a hero wears armour with an 8+ Parry Value attribute, he needs to roll an 8 or 9 on a D10 to parry a strike. Many heroes - and some enemies - employ sorcery in the form of invocations to aid their friends or destroy their enemies. Each invocation has a particular special rule, but they could also work in the same way as a weapon, with a Range attribute, Attack Dice attribute, and so on. After each hero phase the Darkhold Phase begins, and darkhold cards come into play. These cards are unique to each darkhold and represent enemy strategies, natural occurrences, random encounters and all manner of other things! They could change the behaviour of the enemies already on the level if enemy heroes are present, another entry point may appear, tunnel roofs may collapse on top of a hero, random monsters may pop up... who knows? You will, when you play the game! After a darkhold card is played, the enemies already upon the level must perform their actions in the Enemy Phase. In general these will be very simple - either to Move towards the closest heroes, Attack them if they are next to them or Shoot them from afar, just like heroes and henchmen - and the game's artificial intelligence will enable the enemy player (chosen from amongst the players) to perform enemy actions very easily and without thought. Even so, the more powerful enemies can do various other nasty things, so it won't always be simple to defeat them! There will also be rules for players who wish to play the part of the enemy - i.e., you could play a Darkholds game with 1-3 players using heroes and 1 player using enemies, for example! There are many different enemies the heroes will have to contend with. The most numerous enemies will be the Wihts - either Wihtgāras, armed with spear and shield; Wihtaxas, armed with ax and lantern; or Wihtbogas, armed with a bow. They could also be joined by enemy heroes such as a Wiht Thain, who will be a powerful warrior in his own right but will also help his Wihts to perform better; or even a Wiglāca, a human Jute sorcerer who can raise the dead and acts as a mobile entry point! Bigger enemies will appear less frequently (thankfully! ), such as the shrieking Drēaguthas - wraiths full of hatred for the living - or the Gāsta, ancient kings of old who remember little of their former lives and are all the more spiteful because of it. The last level of each area - and the quest's end level - will contain a powerful creature that the heroes must defeat to progress further; perhaps a tomb spider, a huge arachnid able to immobilise adventurers, or a powerful mound beetle able to crush the hardest of heroes in their jaws - and at the end, the mighty Culcca, a Gāst King who holds the secret to life after death. After the enemies upon the level perform their actions, enemy reinforcements occur. Each entry point draws a reinforcement card, which - depending upon the area - reveals the type and amount of enemies that appear. This could be a myriad of different enemies - one Wihtgār, three Wihtaxas, a Wihtboga or two or even a Wiht Thain (plus bodyguard!) - or maybe a Drēaguth or a Gāst! Once the Reinforcement Phase finishes, there's a very short Maintenance Phase where the board is tidied up; noise tokens are removed, prayer or invocation effects expire, and so on. Once that's over, it's time for another Hero Phase! In this way the game continues until there are no more heroes left on the board. 3: Manage your pledge! - then you log in and purchase the items you want, using that Moneyback! That is a simplistic view of what happens, but that's pretty much it. 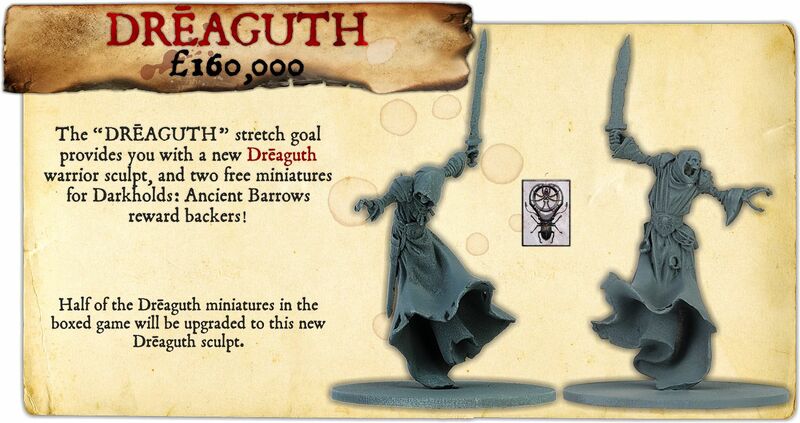 If you already have Moneyback on our webstore, that will not be able to be used on your Darkholds pledge. 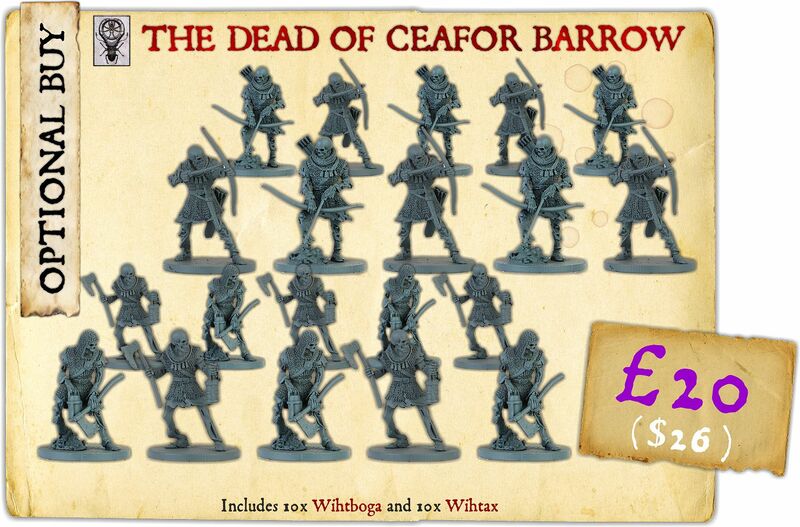 If you need further details now about how you manage your pledge, have a look at the pledge management from our latest previous Darklands project, Darklands: Warriors of Baalor, with the links below. Firstly, it must be noted that you MUST NOT pay for shipping with your pledge. Doing so creates artificial stretch goals and reduces the amount of money we can spend on the game. This ensures that shipping fees are charged correctly for everyone. It's worth re-iterating this in bold letters: DO NOT ADD SHIPPING COSTS TO YOUR PLEDGE - PURCHASE SHIPMENT ITEMS WHEN WE SEND YOU A MAIL! We will ship your reward - at our cost - to our international hubs, dependent upon where you are in the world. These hubs will be in the UK (UK and EU backers) and the USA (North American backers), although if we have a lot of backers from other areas in the world we may well add other international hubs. The following costs are for shipping a standard game package, which is roughly 4kg in weight, by trackable post only. These costs are rough estimates dependent upon current shipping costs and our own experience in shipping tens of thousands of packages over the years. Be warned - these costs may change before the game is shipped, if our shipping providers change their prices. The estimated delivery date is October 2018, but bear in mind this is only an estimate. Additionally, due to the logistics of international shipping, backers in different regions of the world may receive their rewards sooner than others. Please refer to our individual project pages if you'd like to check the progress on them. Our earlier Darklands projects are entirely independent from Darkholds: Ancient Barrows and have no effect on its production. You acknowledge - by pledging to this project - that the final appearance, materials and content of the rewards (and the project) are subject to change and may have altered substantially from what was presented while the Kickstarter project was active. If you do not log in to our webstore and confirm your pledge within eight weeks of our notification via email to confirm your pledge, you agree that we have fulfilled our obligations to you in full for payment or donations received. Unconfirmed pledges make it difficult for us to plan production and logistics, and in the past have led to project delays. For this project we do not intend to allow this to happen, which may mean if you confirm your pledge too late, exclusive items may not be produced in sufficient quantity for your pledge. If you confirm your pledge within eight weeks of our notification via email, you agree that our responsibility to you is to ship your order, that title and risk passes to you upon delivery to a common carrier for such shipment, and you are responsible for import duties or any other duties that may be payable to the relevant tax authorities, providing correct address information and ensuring this address is deliverable by normal methods. We regret we are unable to ship to PO Boxes. 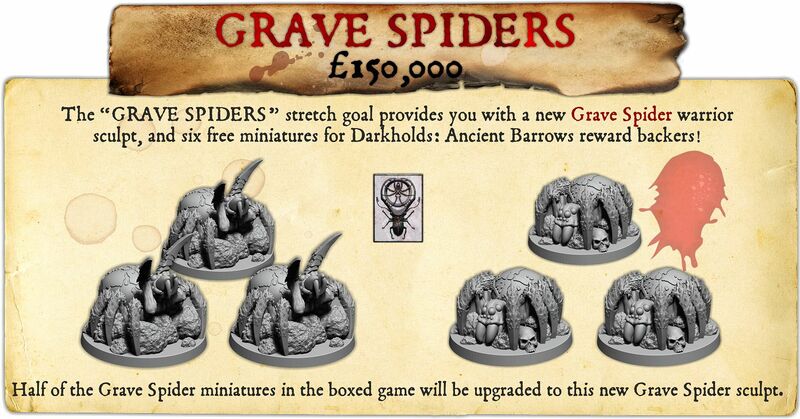 Get the Darkholds: Ancient Barrows boxed game - but rewarded for backing earlier! 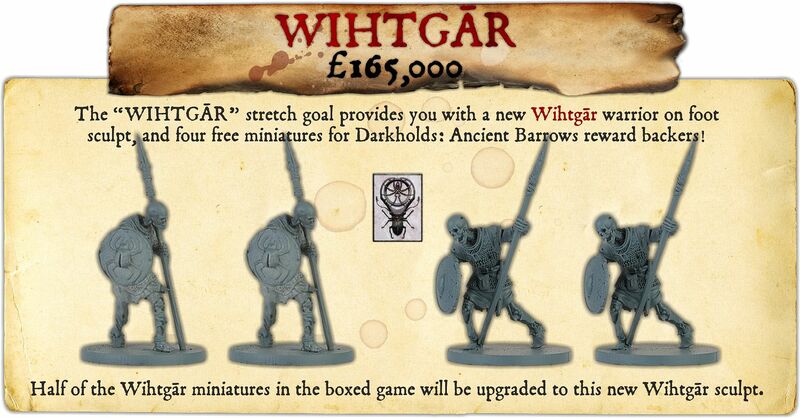 Get the Darkholds: Ancient Barrows boxed game - but rewarded for backing earlier-ish! 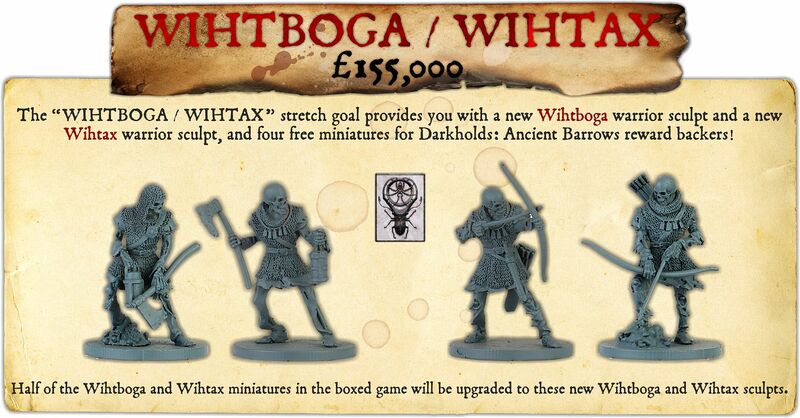 Get the Darkholds: Ancient Barrows boxed game!